We met at the Daily Grind for a crash course to explain the basics of photography including aperture, shutter speed, white balance and focusing. Our first stop was again the courtyard where Schooner Lion is on display. I love this spot; it's a great place for people to get used to all the "new" settings on their dSLRs. Attendees practiced shifting their focus from foreground to background while shooting wide open and then increased their aperture to see the different it made in their images. Many also played around with White Balance, to see the affect it had on the feel of their images. After spending some time there we moved across Thames Street to the pier where the pirate ship Fearless is docked. This was a great place to take images with a very long depth of field. Under Armour sits directly across the water and there were lots of boats out sailing. The lighting wasn't great for outdoor shooting, but these were just practice shots to get people ready for the Golden Hour later in the tour. Next, we stopped at the old Homocide: Life on the Streets HQ building We were graciously greeted by Snowdrift the deaf Pitbull and her master who were sitting on the steps. Both were very friendly, well behaved and kind enough to allow students to take their photos. This unexpected opportunity resulted in some great photo journalistic images. For our mid tour break we headed to The Point in Fells for some yummy light fare, drinks and a slideshow of students images thus far. This also gave everyone time to relax and mingle. Once back out on the street, we worked our way down past HQ to the water taxi stop. Attendees spent some times shooting each other in front of the blossoming trees and hectic background of Fells. We moved down to the Broadway pier just in time for the crew to be furling the top sail on Pride of Baltimore II! As the sun started to set, the Golden Hour of photography arrived, making the water shimmer gold. We moved along from Broadway to Bond Street. The setting sun and the natural light diminishing made it an ideal time to explain exposure bracketing. When the sun was mostly down, we switched to shutter priority to capture some light trails and motion blur as cars drove up and down along Thames. See more pics from the tour below. 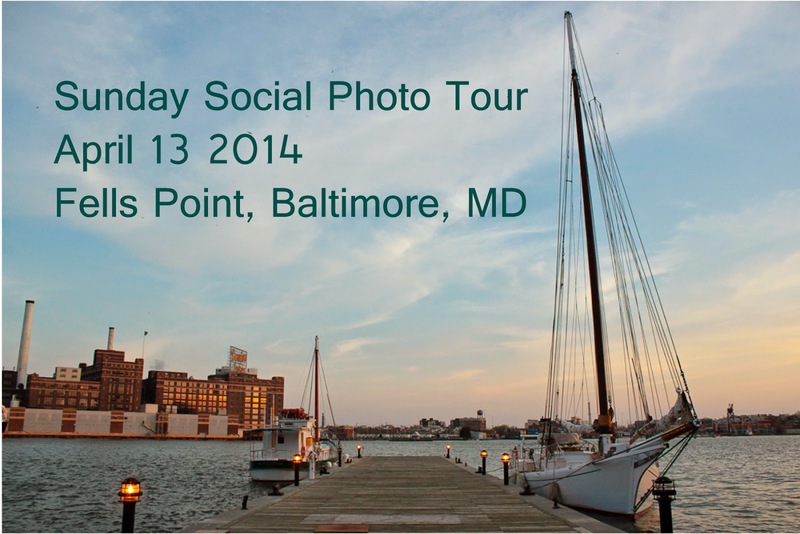 For more info about Baltimore Photo Social or our Sunday Tours, visit us online and follow us for updates! Take a memorable Baltimore Student Tours? In Baltimore, your student group is just a few steps from a world of colorful attractions and living history. Let Great Adventure Tours experienced staff plan all of your Baltimore Student Tours needs.